I am so excited that Cath from Moxie Fab World chose this card for her Tuesday Trigger this week. The image that I used as the Trigger for this card can be seen here: Moxie Fab World. 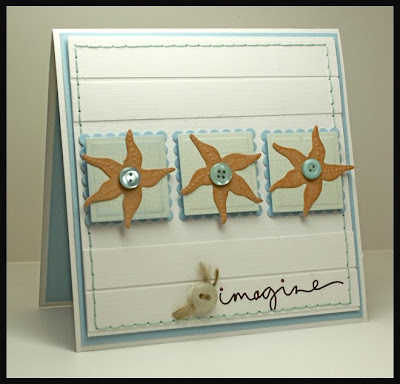 We love the ocean so I am always thrilled for opportunities to use my Spellbinders die templates like the Shells (which are on sale) and of course my Classic Squares Lg and Classic Scalloped Squares Lg Nestabilities. This was a fun project - I hope you can play too. 2009 has been a very busy year filled with experiences and memories of some of my most interesting life-journeys. I hope that the journey you take in 2010 is a path filled with goodness, creativity and that is is memorable one. Woot! Woot! I just saw this on Cath's blog and had to pop in! Gorgeous work, my dear! How fun!!! Love your inspiration pic and your Fabbie card!! Wow - this is so wonderfully summer! Found you on Moxie Fab world - big congrats on having your inspiration piece chosen for this week! Have a wonderful 2010! Your cards are always gorgeous!! !